Clothes retailer Aber-crombie & Fitch Co plans to open more than 100 stores in China under its A&F and Hollister brands over the coming decade, ploughing a new furrow in what it calls "casual luxury." China is the biggest growth opportunity for the New Albany, Ohio-based company, Senior Vice-President of Marketing Craig Brommers said in an interview. It will launch a local e-commerce site later this year. 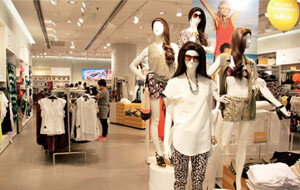 "China will represent the biggest market potential for our brands," Brommers said. "We are entering with strong brand awareness and we feel the excitement is building to the opening of our new flag-ship store." The flagship is in a four-story glass building on West Nanjing Road in Shanghai's Jing'an district, a major commercial area for shop-ping, sightseeing, hotels and office buildings that draws many locals and overseas visitors. Like its other leading stores around the world, the Shanghai outlet features greeters, store models, heart pumping music, classic lighting and the scent of Fierce cologne. It will help Abercrombie stand out in a crowded market place, Brommers said. 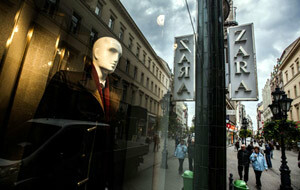 Still, China's retail land-scape is developing very quickly and it is hard to predict the future, he said. 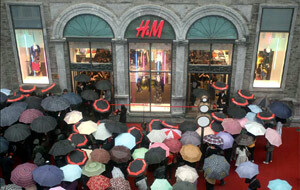 Big cities like Beijing and Shanghai have been especially crowded with new retailers opening shops almost weekly. Last month US clothing company Gap Inc launched a dedicated e-commerce site and opened its first Old Navy store on the Chinese mainland, a 2,000 square-meter, three-story outlet also in the Jing'an district and several hundred meters from the A&F flagship. Brommers is upbeat about Abercrombie's future in China, saying his company is creating a new segment in the retail market called casual luxury, which is reflected in the clothing style and price. "Chinese consumers seem to be looking for something a little beyond just blinged-out luxury logos, and we think the laid-back sophistication that A&F offers is timed right," Brommers said. Asked how the Chinese market will contribute to the company's revenue across its worldwide port-folio, Brommers said: "We didn't make predictions yet but we do know that the seven Hollister stores on the Chinese mainland are offering a very encouraging start. We have seen sales increase at 35 percent for the Hollister stores and we expect similar strong results for A&F in near future." Abercrombie is set to open another A&F store this year in Chengdu, capital of Sichuan province, and is seeking opportunities for both A&F and Hollister in other Chinese cities." When we enter a new market, we generally look for prime locations in the most important shopping districts," Brommers said. "We have found when we expanded around the world that a prime location is the most important ingredient. "It's a not a cookie-cutter format. We have to take the time to find a right location for our brand, "he said.